Sometimes fear is healthy and keeps you from making bad decisions or doing something that’s truly dangerous. Like when you follow the speed limit because you’re afraid of getting a ticket, or you take the medication your doctor prescribed because you’re afraid of getting sick. Those are good things to do and examples of ways fear can actually help you. But much of the time, fear is not your friend. Fear is often a liar that keeps you from moving forward or trying something that could turn out to be good for you. Like when you don’t accept an invitation from a friend because you’re afraid you won’t fit in, or you don’t schedule your mammogram because you’re afraid of what you might find out. Fear tells you to run away from the possibility of something good, even when the reward far outweighs the risk. It tells you you’ll regret your decisions. You’ll screw everything up. You’ll certainly face the worst case scenario. Because fear is a liar. And if you have clutter in your house, I’d bet my bottom dollar that an unhealthy amount fear is behind it, too. In reality, more often than not, our fears are based on a distortion of the truth. This is especially true of our feelings about all the stuff we own. We find ways to justify our decisions and make excuses for why we have so many things and so much clutter. We end up running to buy more stuff and stock up on more things…and we run away from dealing with all the piles and overflowing boxes and cabinets and closets. Most of the time we’re just afraid to get rid of stuff. Once you recognize clutter for what it is, you have to start dealing with it. And once you start dealing with it, you just might face overwhelming anxiety and distorted truths that keep you from ever making any progress. You need to ask yourself some tough questions and figure out if you’re hanging onto your clutter for all the wrong reasons. It’s time to face these lying fears and hit them with some truthful tough love. Are these fears keeping you from getting rid of stuff? 1. I’m afraid I’ll want to use this again (although I haven’t used it in years). Let’s be honest. We all have things we keep “just in case” we want it in the future, even though we haven’t really wanted it for the past few months or years. Before you automatically keep something, ask yourself questions like, “If everything else in my closet was dirty, would I pick something out of the laundry pile or would I wear THIS?” And, “If all my dishes were dirty, would I pull out THIS bowl to use, or would I wash something else instead?” If you aren’t sure you’d use it, then don’t keep it. 2. I’m afraid I’ll fit into it one day and won’t have it anymore. If you’re holding onto clothes because you think you might gain or lose weight, consider if you’ll actually want to wear the clothes you own today when you reach that weight sometime in the future. If you hit that weight next year…two years from now…ten years from now, will you even remember the clothes you got rid of today? And would you truly feel good wearing them, especially if they’re a few years old and possibly out of style? 3. I’m afraid I’ll find the missing parts and won’t have the appliance or gadget they’re for. If you finally find the lost cord, the knob that fell off, or the missing screw, are you sure you’ll even remember what gadget or appliance it was needed to fix? Instead of keeping broken gadgets, it’s usually easier to either buy the missing part, replace the broken item altogether, or learn to live without it (which is probably what you’ve been doing since you lost whatever was needed to make it work). If you haven’t already found the missing piece, you probably won’t magically find it in the future, right? 4. I’m afraid I’ll waste money by not using this product, even though nobody really likes it. If you’re holding onto body wash that your family is allergic to, or lotion that smells funky, or detergent that doesn’t work the way you’d like, then you’re holding onto clutter. Same goes for the shampoo bottle that’s been upside down in the shower for two months or the tube of toothpaste that’s had one last squeeze in it…since last spring. Just let it go, throw it away, and feel the freedom! 5. I’m afraid of getting rid of these things since one day I might sell them on eBay or in a garage sale. It’s time for some truth. Unless you regularly list items on eBay or you have a date set for your garage sale, you won’t likely get those items sold and out of your house anytime soon. That’s just the facts. If they’ve been in a “To Sell” pile for more than a couple of weeks, you need to either sell them today or give them away. 6. I’m afraid of hurting someone’s feelings if I get rid of this. It’s tough when you have items in your home that were gifts you don’t really want to keep but are afraid to get rid of. Think honestly about the likelihood of the gift-giver ever noticing that you no longer own the gift they gave you. If you feel like you must keep something you don’t truly love (for example, to avoid a war with the in-laws), allow yourself one box where you can hide away those unwanted gifts until you display them when it’s absolutely necessary. 7. I’m afraid I won’t have enough if I get rid of these. Sometimes we hold onto things because we’re afraid we won’t have enough of life’s necessities. Maybe you have more towels shoved into the bathroom cabinet than you’ll ever possibly need, or perhaps you have three dozen dinner plates for your family of four. Think long and hard about what you actually use on a daily basis, and give away your extras (or at least box them up to test if you actually need them). 8. I’m afraid of paying too much money if I don’t stock up now. 9. I’m afraid of losing a treasured memory or something of sentimental value. There is nothing wrong with hanging onto some of your children’s art projects, or the movie tickets from your first date with your hubby, or a little trinket your mom gave you when you graduated from college. However, if you hold onto everything that ever meant something to you, none of it will mean much anymore. Have a limited number of boxes or folders for things you want to hang onto and let go of anything that won’t fit. 10. I’m afraid I’ll need it later. There are some items, like tax receipts, that should have their own special home. But remember that now days, most things can be replaced or found online, such as restaurant menus, instructional manuals, and driving directions. It’s also gotten much easier to find things like power cords and replacement parts, so don’t be afraid to get rid of those odd cords and random screws that are littering your kitchen counters and drawers. Hey, I get it. It can be kind of scary to get rid of things. Suddenly, all that stuff you’ve had shoved in drawers, piled on the floor, or hidden away in the basement seems to hold great value. And you can’t see the future to know if you’ll regret getting rid of it. I remember a few years ago when I went on a cleaning spree and got rid of a pile of unnecessary plastic lids from my kitchen drawer. Imagine my surprise a week later when I found the plastic bowls in the basement that were missing all those lids I’d just thrown out! But do you know what? Since those plastic bowls were in my basement (instead of the kitchen), I probably didn’t need them anyway. And after I got rid of them, I never missed them. Not even once. 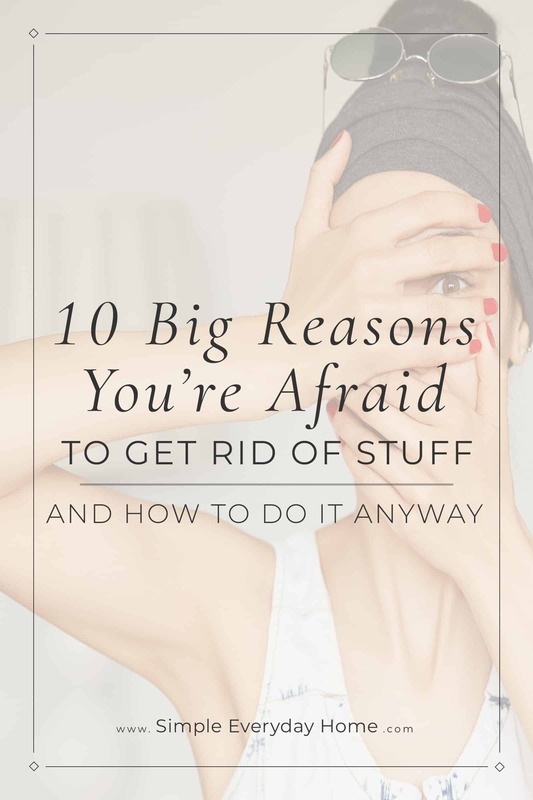 So, challenge yourself to face the (often irrational) fears that are hiding behind your clutter and sabotaging your efforts to fight against it. Be honest with yourself. Most of the time, you’ll never miss the items you get rid of.